Every now and then a headline in a newspaper reads, "British Air Liner Missing" or "Six Planes Lost off the Coast on their way to Miami". For many years the disappearance of ships and planes within the Bermuda Triangle remained one of the world's most puzzling mysteries. Within the past 100 years, ship and plane wrecks along the Bermuda Triangle has been responsible for more than 1000 lives. 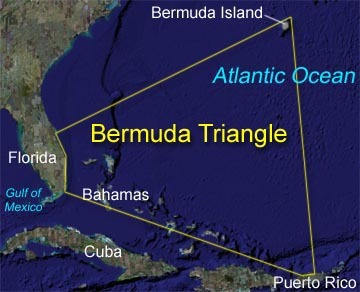 Past generations termed this mysterious place as'The Devil's Triangle', and blamed the Bermuda Triangle on paranormal activity, however, scientists have more recently discovered a logical and scientific explanation behind the mystic behavior of Bermuda Triangle. The Bermuda Triangle is a loosely defined region within 500,000 km square area between Puerto Rico, Miami, and the Island of Bermuda. It is near the Norwegian coast which contains wealthy reserves of natural gas. Scientists believe that methane gas has leaked from the huge deposits of natural gasses which are present deep down in the seabed. Due to the extreme weather conditions and leaked methane gas, hexagonal clouds are formed over this area of the North Atlantic Ocean between Florida, Puerto Rico and Bermuda. Generally, these clouds are distributed randomly and are responsible for creating huge "air bombs", with speeds as high as 170 mph, and 20 to 50 miles wide. These blasts of air come down from the bottom of hexagonal clouds and often create huge waves, as high as 45 feet, after hitting the ocean. A massive force similar to this has the capacity to destroy trees, ships, and even bring down flying airplanes as they are crossing over. This force occurs much like a nuclear reaction, in an avalanche manner and produces massive amounts of gas. Columbus wrote in his journals that while sailing near The Bermuda Triangle, his ship's compass suddenly stopped working and a fireball flew through the sky. The Bermuda Triangle is one of those few places where a compass points towards true North. It creates confusion for pilots and is the reason so many planes and ships lose course in The Bermuda Triangle. The reason behind this anomaly is the Gulf Stream that runs swiftly through The Bermuda Triangle. The turbulent water of the stream, with the aid of mostly unpredictable weather of the Atlantic, creates thunderstorms and can quickly erase any evidence of a tragedy. A total of 6 Navy planes and 27 men disappeared. 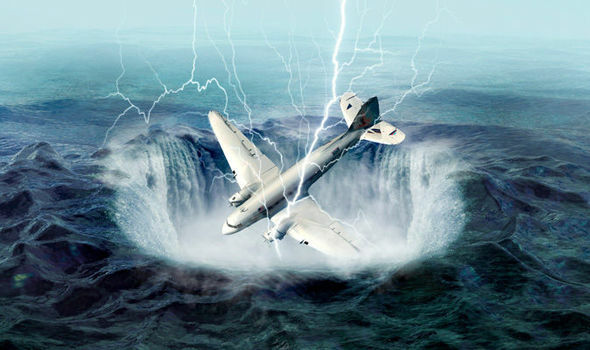 A few scientists believe that when a plane gets caught in the Bermuda triangle, it is transported to a different time period (in the past or in the future). A large area like this is more than the combined area of Louisiana, Texas, and Oklahoma. Boundaries of Bermuda triangle are not clearly defined; their effect extends beyond the triangle as well. MLA (Modern Language Association) "The Mystery of the Bermuda Triangle." ScienceAid, scienceaid.net/Mystery_behind_Bermuda_Triangle%E2%80%99s_disappearing_planes_%26_ships Accessed 25 Apr 2019. Chicago / Turabian ScienceAid.net. "The Mystery of the Bermuda Triangle." Accessed Apr 25, 2019. https://scienceaid.net/Mystery_behind_Bermuda_Triangle%E2%80%99s_disappearing_planes_%26_ships. Thanks to all authors for creating a page that has been read 119 times.